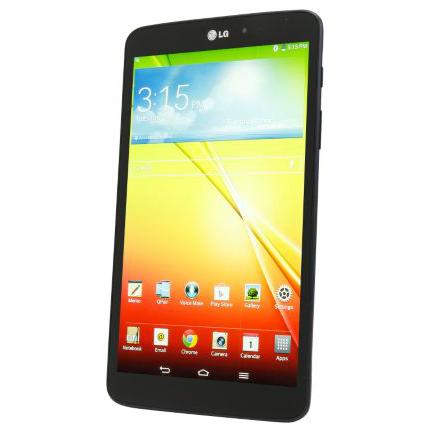 Newegg wants to give you a good deal on the LG G Pad 8.3, as we posted yesterday. But strangely, they're giving an even better price to customers who peruse the company's official eBay outlet: $199.99, a full $25 off of the Newegg sale price. This is the same standard LG G Pad 16GB Wi-Fi model, sold new, and only available in black. Why eBay buyers get a better deal we couldn't say, but it looks like cheap things come to those who wait. The eBay listing has free economy shipping, and only buyers in California, Indiana, New Jersey, and Tennessee pay sales tax. Sorry, international readers and those of you in Alaska and Hawaii, you don't have access to this deal. But those of us in the Lower 48 would be hard-pressed to find a better price on a mid-sized tablet that doesn't come from Amazon. The $200 price is technically $150 off of the MSRP, though bargain hunters can find the tablet much cheaper than that if they look around. Read Cameron's review of the LG G Pad 8.3 if you're on the fence - it's a solid piece of hardware thanks to a metal case, 2GB of RAM, and a 1920x1200 screen, but LG's software layer holds it back. It's a good thing that the G Pad 8.3 (V500 model) has plenty of support from the custom ROM community, or you can track down the more expensive G Pad 8.3 Google Play Edition (V510). The eBay auction is limited to stock, of course, but it doesn't look like the tablets are going particularly quickly.